If you or a loved one has been diagnosed with mesothelioma you have come to the right place. Kazan, McClain, Satterley & Greenwood, A Professional Law Corporation (Kazan Law) has a national reputation for representing people diagnosed with mesothelioma—a deadly cancer whose only known cause is exposure to airborne asbestos fibers. 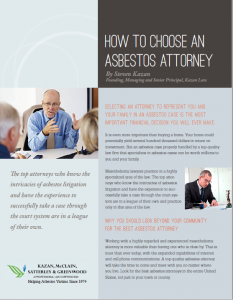 From offices in Oakland, California, Kazan, McClain, Satterley & Greenwood, A Professional Law Corporation (Kazan Law) has been serving victims of mesothelioma and other asbestos-related diseases for more than 44 years. Our 24 attorneys and more than 40 support staff appreciate that you are here because you are confused, frightened and looking for answers to questions about your suddenly and dramatically altered life, and for professional legal representation. This website’s purpose is to supply the necessary information you need to make the best choices about your future and that of your family. For a no-cost evaluation of your potential case with one of our experienced asbestos attorneys, contact us today by calling 1-855-866-6376 or online.